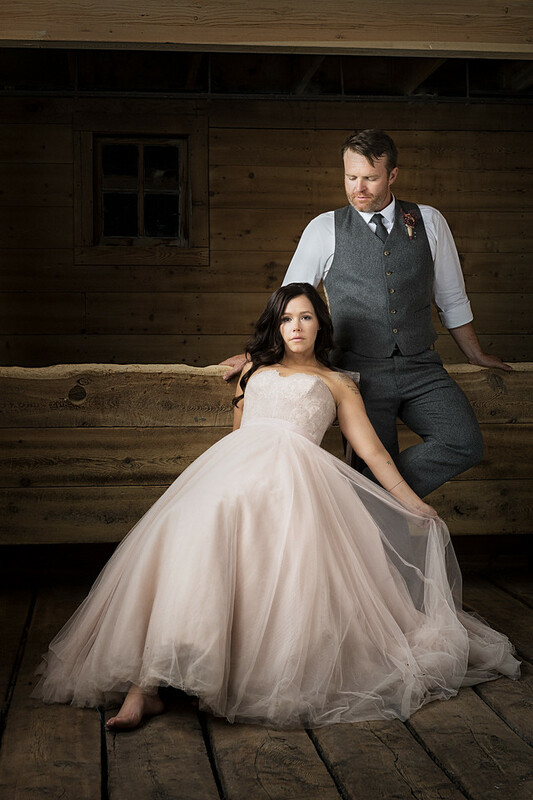 I love this portrait of Alysse and Dan on their wedding day in Bozeman Montana! A beautiful portrait is so timeless, and so powerful! Sadly, portraiture is a lost art in todays cell phone photo saturated world. So we decided to bring a portrait studio to a few weddings this summer and make some elegant portraits of our couples and their guests all dressed up and looking great. This portrait of Alysse and Dan is one of my favorites. Their wedding was at the Big Yellow Barn, so we set up the studio in one of the old stables! Adding our studio lighting with such a cool location really made for a unique set of portraits. Thank you to Alysse and Dan for an awesome wedding day and all of their family and friends for posing for us! Thanks also to Zak Jokela for assisting and second shooting this wedding with me! The idea of a wedding day portrait studio is to make timeless portraits of the bride and groom, and their guests, looking their best, with beautiful lighting and posing from a skilled portrait photographer. It’s an elegant alternative to the wedding day photo booth. With the photo booth the concept is to look silly for snapshots (similar to cell phone photography), while our portraits are crafted for style, sophistication and a quality suitable for making printed photographs. It’s a unique experience for most guests because for most of them it will be one of the very few times they ever step into a serious portrait studio. After the wedding these portraits make great gifts for guests as well. Stay tuned to the blog for more wedding day portraits coming soon and get in touch with us at www.paulbellinger.com if you’re interested in having a portrait studio at your wedding reception. Tips for photographers: The inspiration for setting up a nice portrait studio on location at an event came from the Vanity Fair Oscar Party portraits by Mark Seliger. I look forward to the portraits he does each year, and if you follow him on instagram you can find some behind the scenes photos and videos of the set and lighting that he uses. In this case we were limited by the size of the stable we were shooting in. We set up a large, 6-foot silver bounce umbrella in the stable next door camera left and covered it with a piece of white diffusion cloth so that it created a large soft light as our key light. The key light was just a foot or two above head height, as high as we could get it in the stable. For a fill light we used a 4-foot white bounce umbrella behind the camera to the left also above head height. By placing this light further away it creates an even fill, with little falloff compared to the key light that is closer to the subject. We also had two 4x8 foot white styrofoam reflectors out frame camera right for fill on the shadow side of the subjects. These 4x8 foot reflectors also prevented a color cast from the key light bouncing off the other side of the wooden stable. It’s fun shooting these portraits because they have to go somewhat quickly, but yet still require thoughtful posing, so you’re working really hard and fast and for me that’s exciting.